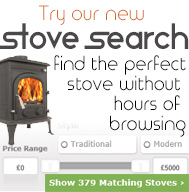 Selecting the appropriate fuel for your stove is an essential ingredient for it to achieve its maximum potential. The fuel chosen must be suitable for the task, efficient and in some cases, approved for use (Smokeless Zones, RHI etc.). This is the most traditional source of economical fuel used in Britain today and is essential for reaching the maximum heat output of your stove. When selecting your firewood, the two most important factors to consider are moisture content and density. The most efficient wood will have been seasoned for at least two years resulting in a moisture level of 20% or less. Any residual moisture in poorly seasoned wood needs to be burnt off before any heat is produced and this can leave tar deposits in the flue, potentially damaging your Flexible Chimney Liner. Coal burns at a considerably higher temperature than wood and is only suitable for use in multi-fuel stoves and is not recommended for overnight burning. Authorised for use in Smoke Control Areas, smokeless fuels can come in a few forms such as naturally occurring anthracites, smokeless coke or smokeless briquettes. Manufactured in distinctive shapes or with identifying marks, these have all had their volatile matter removed via the application of pressure or heat and as such are the only fuels recommended for overnight burning or ‘slumbering’. The most efficient and environmentally friendly form of wood fuel, pellets are sourced from the waste product of wood industries which is then compacted and compressed into a small dense wood pellet with very low moisture content. Designed for use with pellet stoves and biomass boilers, this incredibly efficient renewable energy is heavily incentivised by the government under their domestic Renewable Heat Incentive (RHI).